Original Content: I Know, I Know. You're All Anxiously Waiting To Hear How My Weekend Went. I Know, I Know. You're All Anxiously Waiting To Hear How My Weekend Went. 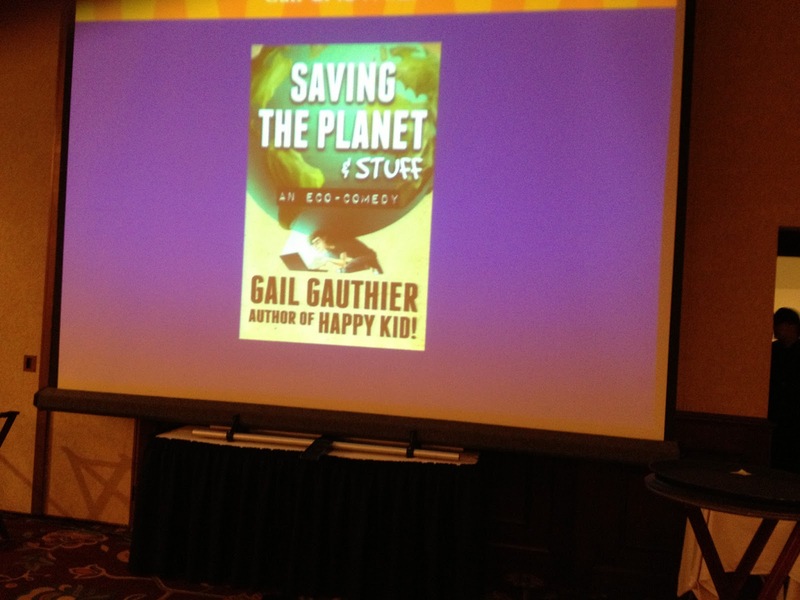 That's my weekend at the New England Society of Children's Book Writers and Illustrators Conference. And you are all waiting to hear, right? I hope so, because that's what's coming. 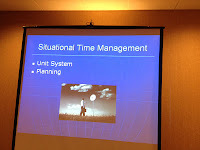 First off, the workshop I led on Friday, Situational Time Management, appeared to go very well. Dinner was soon afterward, and I did not feel a need to spend every cent I had with me at the cash bar. Though I did spend some. Earlier in the day, I attended a workshop called Keyword By Word: Create a Plan to Brand, Sell, and Promote Your Novel, which was led by A.C. Gaughen and Hilary Weisman Graham. 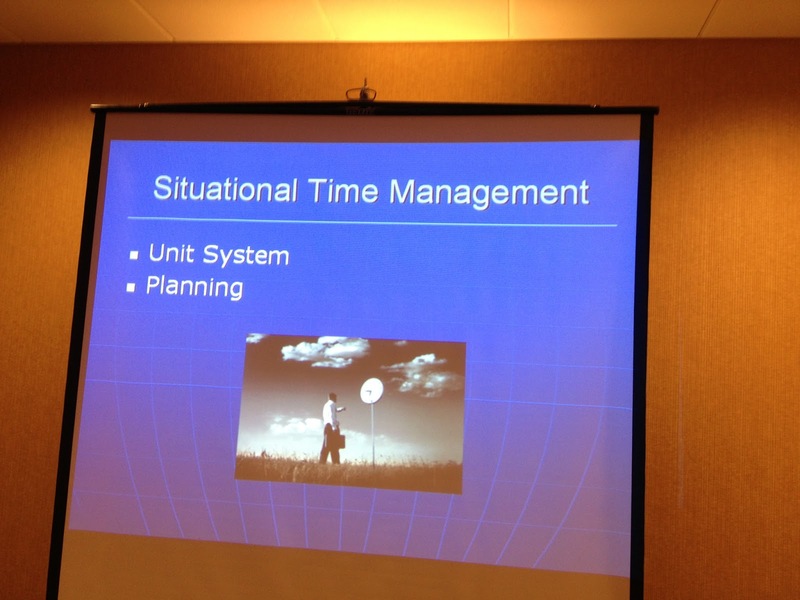 This was notable because, in my experience, dual presenters don't always work that well. They can sound awkward and uncomfortable. In this case, they worked very well indeed. I think the difference was that Annie and Hilary had plenty of material and good mastery of it. They also clearly had a plan. They weren't just up there winging it. Keep this in mind, people, if you are ever tempted to offer to run a workshop with a friend. 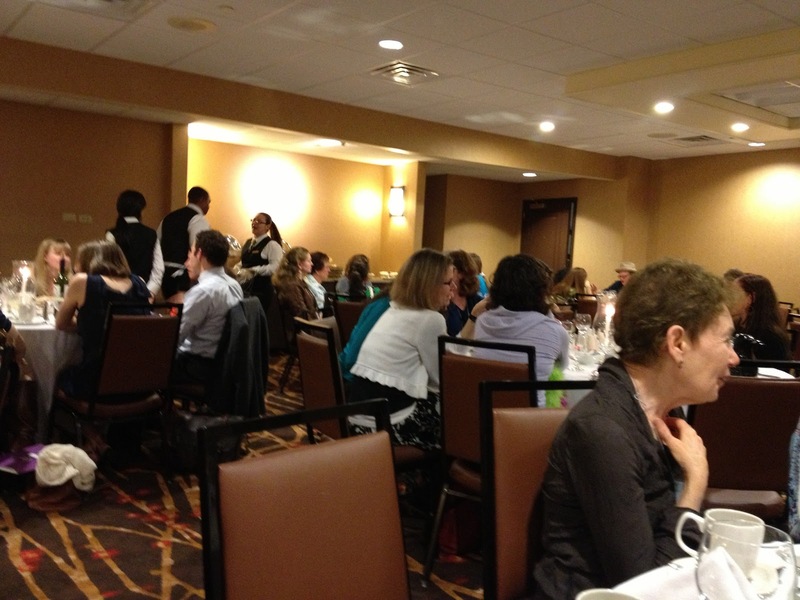 I am including this shot of the Faculty Dinner on Friday night just to prove I was invited and was there. Oh, and get this! I am seated at a table and, there, across the room, I see a familiar face. Our eyes lock. It was...Leila Roy from bookshelves of doom! I shoved my way through all the other diners so we could meet in the real world. I actually had someone take our picture together. Unfortunately, in it I look like, well, let's say I look like Leila's hip aunt who is much younger than her mother but way shorter than Leila. Yeah. Let's say that. So we're not publishing that. Later that evening, while doing my version of mingling, I met Charlotte from Charlotte's Library. In this case, she recognized me, probably because I look like Leila Roy's hip, short aunt. Seriously, I was delighted to run into both of them. 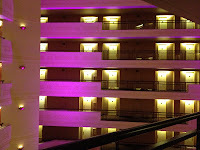 I am including a shot of the interior of the Sheraton in Springfield. 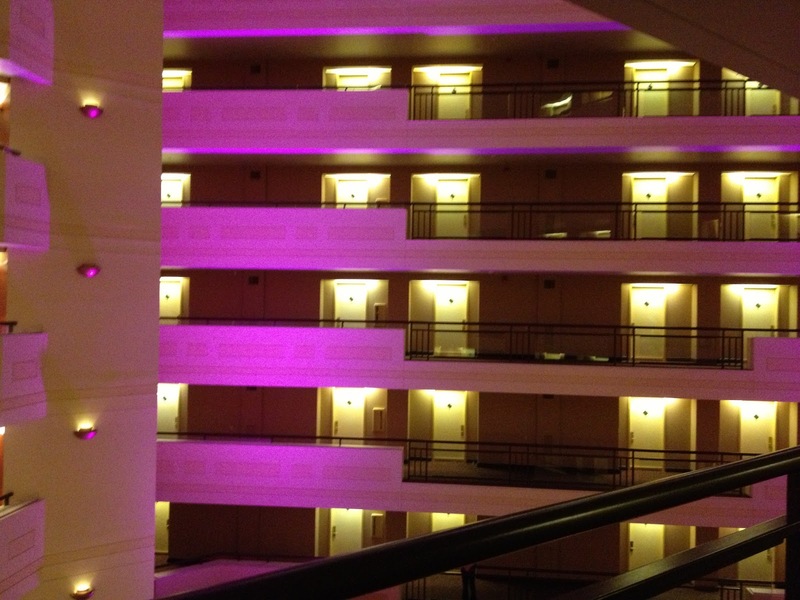 This was the view from the door of my room. Marlo Garnsworthy, a Facebook friend whom I met for real in the elevator this past weekend, has a much better picture of this scene on her Facebook page. I love the view because it looks like something out of a sci fi movie. Friday night roommate Erin Dionne and I met on Facebook after we got our room assignment, so we weren't total strangers. An absolutely lovely woman. I headed home on Saturday morning for a number of reasons. Late Saturday afternoon, I started a 4-hour shift doing some ground work for my May Days project, which I wanted to take back to the conference the next day for the three-hour Advanced Plotting workshop I was signed up for. Chris Eboch led this. It was the best craft workshop I've ever taken. We ended up doing a short, on-the-spot writers' group during it. It's been years since I've been able to be part of a writers' group. This one was fantastic. At some point I'll cover writers' groups as part of my Weekend Writers series, and I'll discuss why this one was so good. I finished the day with Lynda Mullaly Hunt who led the workshop Researching Agents in Order to Find the Right Match for You. This was another excellent workshop because, like everything else I attended this weekend, the leader actually knew her subject and had lots of material participants could walk away with. Are you seeing a recurring motif here? I mean, as far as the workshops are concerned, not as far as my meeting and greeting people and hitting the cash bar goes? Yeah, I like workshops with lots of material organized in a meaningful way. One last piece of info to pass along--images of the faculty member's book covers kept coming up on two screens in the ballroom where we ate lunch. Yes, yes, that's right. I got up and stood in front of the screen until mine came up again so I could get this picture. These are just the blogs I could easily find on my Facebook wall. Feel free to add your NESCBWI conference posts in the comments. Organized workshops are good. Also I'd add that we tried not to over-manage the Sunday morning panel I was on, but also not go to that other extreme of moderators who want to "let things flow organically." Uh oh. Now I know where you flew when you disappeared form the table. Next time I hope to say more than hello, though that was nice! And I once had Erin as a roommate, too, and concur she is the best! Jeannine, Yes, in my experience people often think "flow" and "organic" mean wander aimlessly. Well, Kip, the only thing you had over me in the silliness department was the jumping on the bed picture. Your post gives a much better picture of networking than my does. Wow, I just stopped by to see a roundup of the conference (most of which I missed because I was giving my own presentations), so what a lovely surprise to see positive comments about my workshop. And you gave me an idea, with the writers group – maybe next time I should invite people to exchange e-mails if they want to follow up and continue critiquing together. Chris--One of the women at my table suggested we all exchange business cards, which we did. She was the only person I was able to find on Facebook, so I won't be able to stay in touch with the others in any kind of regular, orderly way. Hmmm. Though I should see if the others have blogs, which I could add to my blog reader. I happen to already be Facebook friends with 3 other people from your plotting workshop, including Kip, above.